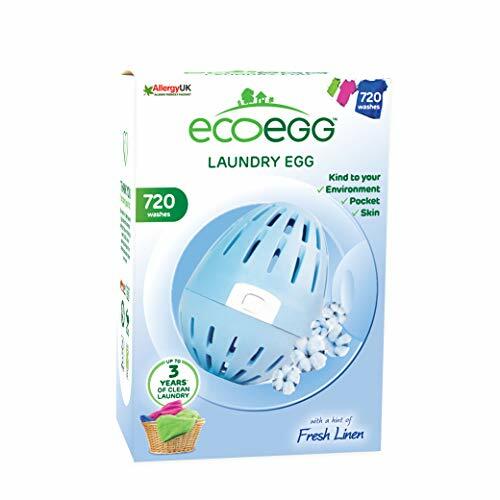 The natural detergent breakthrough - Completely replaces washing detergent - Dermatologically tested The award winning Laundry Egg is a complete replacement for washing detergent. Just pop it in the drum of your washing machine - no powder, liquid, tablets or gels required. The two types of mineral pellets inside the egg get to work, producing powerful - but natural - cleaning foam which powers through the fibres lifting off the dirt and grime. Powerful results Independently, laboratory proven to perform just as well as regular detergent, our innovative Laundry Egg is a real alternative to harsh chemicals - giving great results, naturally. Great for sensitive skin Supported by Allergy UK and the National Eczema Society, the Laundry Egg is dermatologically tested and perfect for even the most sensitive skin. Long lasting: under 3p per wash It lasts for 720 washes; that's 3 year's worth of laundry for the average family - imagine the money you'll save not having to buy detergent for the next year! Each load works out to be just under 3 pence per wash. Available in Soft Cotton, Spring Blossom or 100% Fragrance Free.